These little baskets, made from laundry powder scoops, are so pretty and versatile. They can be used for children’s baby dolls, to hold soaps or coins, or to make gift baskets for baby showers. 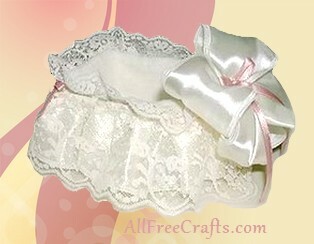 Note: Width and length of lace and ribbon will vary depending on the soap scoop size. Wired ribbon should be as wide as the scoop is tall. Gathered lace should be at least 1/2 inch wider than the scoop is tall. Wash the soap scoop well and dry it completely. Remove the wire from one side of a ribbon piece (approximately 1 yard length) by pulling the wire out from one end. Gather the other side of the ribbon by securing the wire at one end of the ribbon and pulling the wire from the other end. Gather the ribbon as evenly as possible. The gathered piece of ribbon must be long enough to wrap around the entire scoop basket top plus one inch. Once you are sure that the ribbon will fit, cut the excess wire (you may want to leave a few inches of extra wire attached, just to be sure) and set aside the wire for later use. Hot glue the gathered edge of the ribbon along the top edge of the scoop, beginning at the under side of the handle, bringing the ribbon to the top of the handle, working around the scoop and then under the handle. This is where your ribbon seam will be (under the handle). Apply a little hot glue to the cut edges of your ribbon to keep them from unraveling and fold under to hide the seam. Cut another piece of ribbon approximately 6 inches long. Fold the two sides to the center (length-wise) and wrap around the handle (folded edges on the underside) to cover the entire handle. Secure with a little glue on each wrap-around and be sure to secure well at the start and finish of the wrap. The handle may be used to lift this basket and you don’t want the ribbon to slip off. Glue your lace piece around the entire basket sides, once again, beginning and ending under the handle. Fold your seams under and if necessary add a little fray check or glue to keep the lace from unraveling. Cut a piece of fleece or felt to fit the inside sides of the scoop. To do this, simply measure around the inside perimeter of the scoop to determine the length and from the top to the bottom of the scoop to determine the width. Leave about 1/2 inch additional fleece, on the width of the fleece, as you will lay a second piece on the bottom of the scoop, to cover this. Glue fleece along the top edge of the scoop, meeting the lace that has been attached. Fleece and felt will not fray, so do not worry about the start and finish seam. Simply turn the seams under slightly, at the handle area and secure with a little glue. To cut a piece of fleece that will fit perfectly on the inside bottom of your scoop, place your scoop on top of the fleece and draw around the bottom of the scoop. Cut out along the lines. Insert this piece inside the bottom of your basket and secure with a few dots of glue. Using the same ribbon as you used for the underskirt, make a small bow and glue the bow the top of the handle (on top of your ribbon handle). Add a small bow made with pink silk ribbon to the center of this bow and an additional pink bow to each front outside corner.